We all choose our vices. For the small town of Ashborough, New Hampshire (population 1,712), cable television is the one thing that can drive a community apart. Cable is not allowed. Automobiles, the Internet, telephones, and pretty much every other modern amenity are just fine and apparently do nothing to dissolve a community. As soon as people can watch The Walking Dead, everything immediately collapses. Dr. Michael Cayle (Sean Patrick Thomas) and his family will just have to learn to live without cable. They are new residents of Ashborough. Michael purchased the town’s only medical practice along with the late doctor’s sprawling house. Unfortunately for the young doctor and his family, they chose a town plagued by “isolates,” a breed of wild men that have lived in the area for centuries. 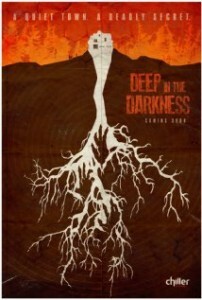 The wild men co-star in Chiller’s latest original movie, Deep in the Darkness, premiering on Friday, May 23rd. It is another uninspired effort from the network, slightly better than the very bad Beneath and Dead Souls, but not by much. It’s disheartening to see Chiller churn out such generic and dull movies. Like its predecessors, this one does nothing remotely interesting with a workable premise (based on a novel by Michael Laimo) and sputters along until the end credits roll. You’ll be lucky to remember anything by the next morning. Our information about the wild men comes from Phil (Dean Stockwell), a longtime resident. He lives near Michael and tells him all about the strange beings. They control the entire town and require sacrifices in exchange for allowing people to live. When Michael eventually crosses paths with them, he desperately wants to get his family out of dodge. Phil says to not even bother with fleeing. The wild men won’t allow it. Where Deep in the Darkness really fails is in its depiction of the wild men. For starters, despite brutally attacking and sometimes killing people, they fail to register as truly frightening beings. They are short and small and covered in mud. They look like dirty kids and are not menacing. You never buy that these things could imprison and terrify an entire town. This is only reinforced during physical confrontations late in the movie. They are disposed of quite easily. The budget is also a hindrance. Though the wild men have an entire town under their thumb, outside of a brief scene at a church, the movie basically has two locations: the doctor’s house and the caves where the wild men live. There are very few characters and there’s no palpable sense that 1,700 people are living in fear every day of their lives. A few cheap but fairly effective jump scares and a competent cast prevent Deep in the Darkness from being a total timewaster. Thomas, who has starred in Dracula 2000 and Halloween: Resurrection among many other films, is a solid lead, and Stockwell is an old pro who knows how to deliver an ominous speech and make it sound convincing. Sadly that’s about all the movie has going for it, which isn’t nearly enough to make it something you should make time for.